MIAMI — Goran Dragic is going back to his native Slovenia in a few weeks for the summer. There's a couple of weddings the Miami Heat guard needs to attend, a trip scheduled with his wife to Paris for a fashion show and probably even some pickup basketball to remind his friends that he's an NBA All-Star and they aren't. Winning the European title last summer is still a huge deal to Slovenians, which means Dragic's homecoming will be a huge deal as well. He was recently voted as the most influential Slovenian, a poll conducted by media in that country who picked people from the sports world to the top six spots. No. 7 was U.S. First Lady Melania Trump, and No. 8 was Slovenian President Borut Pahor. Leading that list shows what Dragic's countrymen think of him, especially after he led the nation to probably its proudest sports moment. "As soon I go out with my family, walk around the town, probably that's going to be the time I'm going to start realizing how much that was a big deal," Dragic said. "We'll see." "We'll see" is a mantra of sorts for Dragic's summer. Even though Heat President Pat Riley said no one on the roster is untouchable if the right deal comes along, Dragic has made clear that he wants to stay in Miami — and let his bosses know as much. He raves about his house, the one with the newly upgraded landscaping because he intends to be there for a long time. He likes the makeup of the locker room, and has too many favorite restaurants in Miami to count. Plus, he's very much a fan favorite. Out for dinner this week, Dragic was approached by about a dozen people seeking autographs or selfies — plus one who wanted him to have a video chat with a child home studying. Dragic never complained, routinely getting up from his soup, salad, broiled snapper and cappuccino nightcap to accommodate every request. "This is where I want to be," Dragic said. "Everything here, it's the way I want it." He's not going to touch a basketball for a little bit, in desperate need of some time off. Eurobasket — the tournament where Slovenia beat Serbia for the gold medal — went into mid-September, and Dragic didn't get to Miami until the day before training camp. He basically hasn't had a break from playing for a full year, and paid the price for that this season with the Heat. 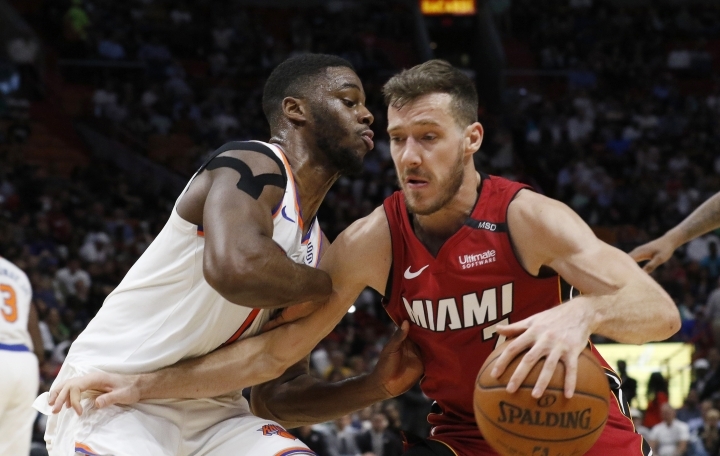 Dragic was an All-Star for the first time, but dealt with nagging injuries, and soreness in his right knee limited him considerably in Miami's five-game playoff loss to Philadelphia. "I felt it the whole season," Dragic said. "Mentally I was OK but physically I had minor injuries. You know those injuries, if you keep playing they never go away. But it was nothing serious that I could not play. You're always battling against your thoughts, against your head. But if you're asking me if I would do it again ... yeah." Thing is, he won't be doing it again. Slovenian officials came to Miami this season begging Dragic to reconsider his decision to retire from the national team, and he declined. The only thing that will lure Dragic back into the international game is if Slovenia makes the 2020 Tokyo Olympics, which won't be easy especially if he isn't going to partake in qualifying. He's also been asked to consider running for political office, which is an absolute non-starter for Dragic. But summers in Slovenia are still very important, both for relaxation and to remind his kids of their heritage. "My country, they give me everything," Dragic said. "I was in school there. They make me (the) person I am now. I have friends, family, we always as a family we're really tight. I always cherish my ancestors, my grandpa, great-grandpa, what they did for us, especially my dad who moved from Bosnia. He started a new life in Slovenia so basically I grew up there." And he's desperately hoping he'll remain in Miami. "I think we have all the pieces here," Dragic said. "I think I'll be better. I think we'll be better. I want to see how good we can be."